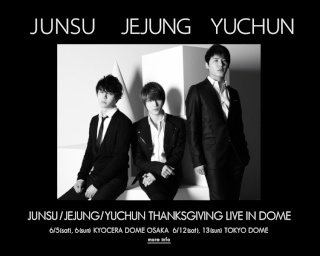 It has been decided that JunSu, JeJung and YuChun will form a new unit! The new unit will be working under the management and the contract with avex management company. Moreover, in order to show their gratitude to fans, it has also been decided that the 3 of them will be performing at Dome events as a new unit. 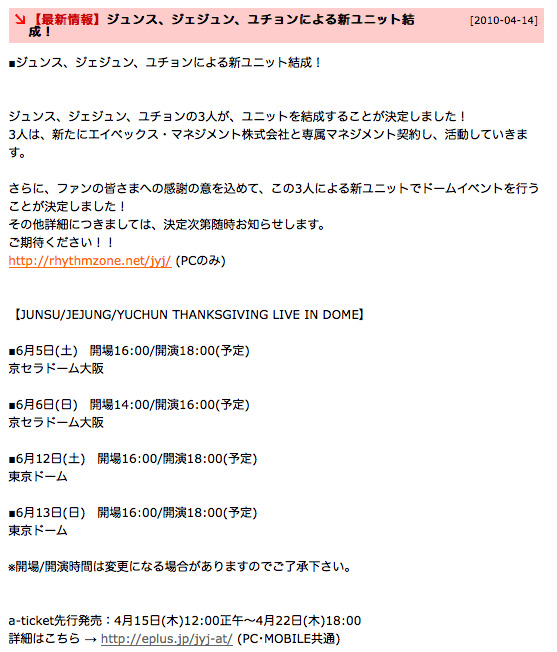 ※Please notice that there might be a change in opening and starting time. TVXQ’s Jaejoong appeared at the telephone shocking corner of Waratte Iitomo. Jeajoon’s drama will start on the 15th at the same TV station. The flowers which were sent for Jeajoong were from Eriko Kitagawa and EXILE, Every Little Thing and Haruka Igawa, Juri Ueno of the actress, Biggest of the fan club of TVXQ. Many flowers lined up in the studio, and the numbers of them overflowed in a lobby. In the corner, Jeajoong shared by saying, “I do not get drunk no matter how much I drink” and clarified that since he eat a lot, weight training was indispensable. He also said that he likes very hot food and recently he is fond of Curry House CoCo Ichiban’s “Super Spicy Powder” to add it on top of already very hot curry which is spiced numbered the hottest #10 level at CoCo Ichiban. Asada Mao(19) goes to Tohoshinki’s usual Korean food restaurant and shows smile at night “Junsu(23) LOVE”Even asked a waiter and got the “Junsu seat”!! Asada Mao(19) who answered a interview at the ice show “Stars on Ice” saying “Right now what im interested in the most is gourmet. I want to eat a lot of good food”. Just like what she said at the press conference on the night of the 8th after practice with her mother and sister she went inside a Korean food restaurant in Akasaka with her “glasses outfit”. The restaurant is very popular starting from Tohoshinki, Park Yongha, Ryu Siwon and many other Korean stars. Also many Japanese actors and idols visit and there are a lot of autographs inside the restaurant. “Where Mao-chan sat was the 4th floor and the very inside. That’s where usually the Tohoshinki members sit. Mai-chan(her sister) and Mao-chan passionately requested the seat”-Staff. 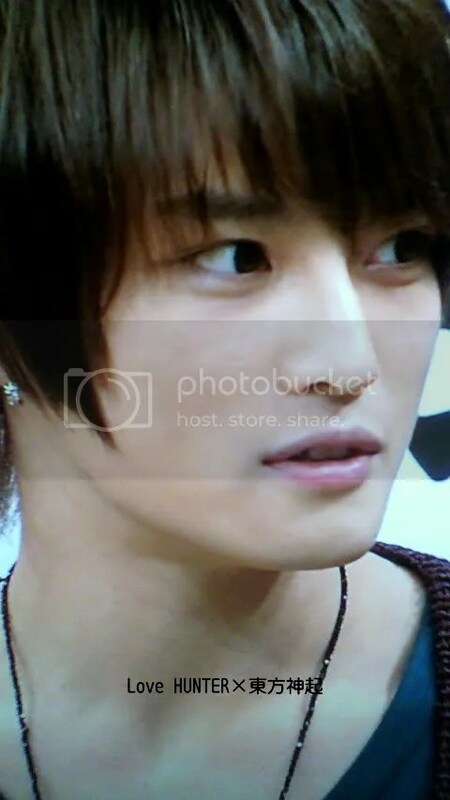 After coming to this restaurant in 2004 for the first time, Tohoshinki has become their usual.After it became a new year, in January Changmin(22), in February Jaejoong(24) came with the staffs. Also in April Yoochun(23) came too. Also the seat that they always sit is the 4th floor in the very inside seat. The sisters knew very rare information it seems that the sisters are a big fan of Tohoshinki. What she ordered was pork meat and kimchi inside a mountain yam which is called a Possamu. In 2007 June Tohoshinki and Ryu Siwon actually came together and ordered that menu. Other than that Mao-chan ordered Galbijjim, Bulgogi,and Samgytang. It seemed that they were happy eating it. About 1hour and a half after they finished the Korean gourmet, they didn’t catch a taxi but instead they walked in the busy night. It was reported by CHOSUN ONLINE NEWS on April 10th, that Hinano Yoshikawa is a Big fan of TVXQ. Three Japanese celebrities, Masami Hisamoto, Natsumi Ogawa, and Hinano Yoshikawa, who are all fan of Korean stars gathered and named themselves as “Team Hisamoto”. Hinano Yoshikawa loves K-pop and she is a big fan of TVXQ. At Seoul, Korea, with the help of Korean comedian Heryon, three of them (team Hisamoto) aim to shake hands with 77 Korean stars in Korea. One of the most popular fashion icon of Japan, known for her outstanding figure and charming looks. Hinano has been running the top ever since her debut at the age of 13. In 1997, she started acting for films, and was awarded New Comers Prize at the Japanese Academy Award. Her immeasurable talent can be seen on various TV shows, fashion magazines, and advertisements!! There are kind of help fans show for their favorite stars which is called “Support”. The fans prepare lunch and food for the program staff and ask them to take good care of their favorite stars. 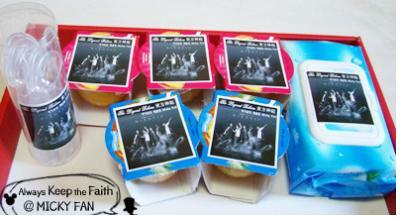 The Photo shown (above) is the food support from “MICKY FAN” (Fans of TVXQ’s Micky Yuchun). This kind of support is shown often in the relationships of a male pop stars and the female fans. It appears kind of similar to the wife’s support to their husband, which a male receives the support from female who is very giving. From left to right: Ranking number, last week’s ranking number, title, and release date. Xiah Junsu’s 1st single CD will be released on May 26th.